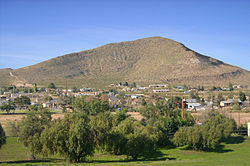 Sierra Blanca is a census-designated place (CDP) in and the county seat of Hudspeth County, Texas, in the United States. The town is part of the Trans-Pecos region of far western Texas. The town is located northeast of the Mexican border and is within the Mountain Time Zone. As of the 2010 census, the population was 553. The town was founded in 1881 at the completion point of a long-sought southern transcontinental railway. Sierra Blanca has served as the junction of the Southern Pacific and Missouri Pacific railroads. Hudspeth County was formed in 1917 from El Paso County. Sierra Blanca was named the county seat, and has the only adobe courthouse in the state of Texas. The town continues to accommodate travelers between Van Horn and El Paso along Interstate 10, which is the main route that connects Texas from west to east. The town was named for the nearby Sierra Blanca Mountains, which were named for the white poppies which grew on them (sierra blanca is Spanish for "white range"). The letters "SB" can be seen on a nearby mountain from Interstate 10. On July 13, 1944, three Army Air Force crews from El Paso's Biggs Field, 86 miles west of Sierra Blanca, took off on a practice mission. They proceeded to drop 10 practice bombs on Sierra Blanca. Five of the bombs disabled the main line shared by the Southern Pacific and Texas & Pacific Railroads. Another dropped on a gas station driveway, but missed exploding the fuel tanks. There were no injuries or deaths. Sierra Blanca is found in Far West Texas, a subdivision of West Texas, and is located at 31°10′55″N 105°20′27″W﻿ / ﻿31.18194°N 105.34083°W﻿ / 31.18194; -105.34083 (31.182009, -105.340843) 4,520 feet (1,380 m) above sea level. The town is part of the Trans-Pecos region within the most mountainous and arid portion of Texas. The town is located in Hudspeth County which is large and sparsely populated. Sierra Blanca (White Mountain), at an elevation over 7,000 feet (2,100 m) above sea level, towers over the town to the northwest and is the most prominent mountain peak of the surrounding mountainous terrain. According to the United States Census Bureau, the CDP has a total area of 4.8 square miles (12.4 km2), of which 4.7 square miles (12.3 km2) are land and 0.04 square miles (0.1 km2), or 0.52%, are water. Soil in the surrounding area is mostly non-arable and cannot sustain large-scale farming. Due to the high altitude of the town, it has a cooler climate than other areas of the Chihuahuan Desert. Summer days are hot with cool summer nights. The town occasionally experiences high winds and dust storms. June is regularly the warmest month, with the highest recorded temperature in town being 109 °F (43 °C) in 1994. During the winter the jet stream will periodically dip far south and bring extremely low temperatures. December is usually the coolest month, and the lowest temperature recorded was −10 °F (−23 °C) in 1985. Normally, the town receives less than 1 inch (25 mm) of snow annually. During the hurricane season large tropical storms can sometimes bring large amounts of precipitation to the arid mountainous region and can cause flash flooding. The town on average has 293 sunny days and 43 days of precipitation. Rainfall is low; the town and vicinity receive an average of 11.27 inches (286 mm) of rainfall annually. As of the 2010 census, the population was 553, 172 households, and 126 families residing in the CDP. The population density was 116.0 people per square mile (50.6/km²). There were 227 housing units at an average density of 55.8 per square mile (21.5/km²). The racial makeup of the CDP was 83.91% White, 3.44% Native American, 3.25% Black, 1.45% Asian, 7.96% from other races, and 3.56% from two or more races. Latino of any race were 72.61% of the population. There were 172 households out of which 40.2% had children under the age of 18 living with them, 45.72% were married couples living together, 13.0% had a female householder with no husband present, and 31.0% were non-families. 28.3% of all households were made up of individuals and 11.4% had someone living alone who was 65 years of age or older. The average household size was 2.63 and the average family size was 3.31. In the CDP, the population was spread out with 29.8% under the age of 18, 11.8% from 18 to 24, 30.8% from 25 to 44, 18.4% from 45 to 64, and 9.2% who were 65 years of age or older. The median age was 34.3 years. For every 100 females, there were 96.0 males. For every 100 females age 18 and over, there were 101.1 males. The median income for a household in the CDP was $32,464. The per capita income for the CDP was $14,682. About 19.6% of families and 22.5% of the population were below the poverty line, including 28.3% of those under age 18 and 32.6% of those age 65 or over. Sierra Blanca is served by the Sierra Blanca Independent School District; it spends an annual average of $6,343 per student. On average there are 10.9 students per teacher. For the demographic group older than 25 years: 68.6% have a high school degree; 3.2% have a Bachelor's; 2.6% have a Graduate degree. The cost of living in Sierra Blanca is about 20% less than the US average. Sierra Blanca has a high home ownership rate of 49.5%. The median home is valued at $54,600 with a 1.94 annual percent appreciation. As of December 2013, the unemployment rate was 5.4%. Starting in 1992, a few miles from Sierra Blanca was the location of a sludge dump that received 250 tons of treated sewage each day by train from New York City. The practice was discontinued in 2001, after local complaints about odor and negative impact on health. Press reports indicated that in 2013, the town supported three restaurants and a motel. There is no grocery store in the community. In September 2012, singer Fiona Apple was arrested at a checkpoint for possession of small amounts of marijuana and hashish, and spent the night in jail there. A few weeks later, a Nelly tour bus was stopped at the same checkpoint, and ten pounds of marijuana were found on the bus along with heroin and a loaded gun. The singer was not arrested, but a member of his entourage was. Previously, musicians Snoop Dogg and Willie Nelson as well as actor Armie Hammer had all been arrested separately for drug possession in Sierra Blanca. The U.S. Border Patrol checkpoint at Sierra Blanca sends the county thousands of drug cases a year and inspects 15 to 20,000 vehicles every day. The county is unable to prosecute the vast majority of these cases as the federal government no longer funds such activities. ^ a b "Geographic Identifiers: 2010 Census Summary File 1 (G001): Sierra Blanca CDP, Texas". American Factfinder. U.S. Census Bureau. Retrieved March 19, 2018. ^ "Sierra Blanca". The Handbook of Texas Online. Texas State Historical Association. Retrieved 2012-09-21. ^ "Hudspeth Courthouse". Texas Escapes - Blueprints For Travel, LLC. Retrieved 12 May 2010. Texas Escapes - Blueprints For Travel, LLC. ^ "Sierra Blanca, Texas". TexasEscapes.com. Retrieved 2012-09-21. ^ "Texas Legacy Project: Conservation Archive and Documentary: Transcript: Bill Addington". TexasLegacy.org. 2001-03-28. Retrieved 2012-09-21. ^ Greene, A.C. 1998. Sketches from the five states of Texas. College Station: Texas A&M University Press, 176 pp. ^ "Monthly Averages for Sierra Blanca, TX". The Weather Channel. Retrieved Dec 15, 2013. ^ Yardley, Jim (2007-07-27). "New York's Sewage Was a Texas Town's Gold". The New York Times. Retrieved 2009-03-18. ^ "Sierra Blanca, the Nation's Largest Sewage Dump", Toxic Texas, http://www.txpeer.org/toxictour/merco.html, retrieved August 7, 2017. ^ a b c "Fiona Apple reportedly arrested for hash possession". Washington Post. TMZ. 20 September 2012. Retrieved 2019-01-09. ^ "Rapper Nelly: Cops Raid Tour Bus, Heroin Seized". TMZ. TMZ. 12 October 2012. Retrieved 2012-10-12. This page was last edited on 13 April 2019, at 05:48 (UTC).